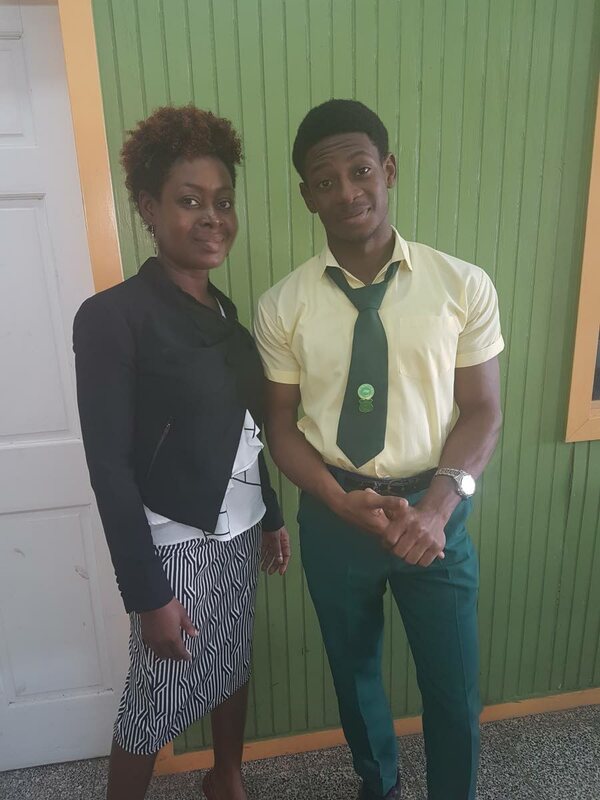 Signal Hill Secondary student, Kemeul Henry Abraham, who placed fourth in the Caribbean in CAPE Level 1 Building and Mechanical Engineering Drawing at CAPE, shares a moment with his mother, Stacy Abraham, who is also his teacher for this subject, at the school on Monday. “I think I could have done better.” So said Signal Hill Secondary School student, Kemeul Henry Abraham, 17, who placed in the Caribbean in level 1 of the Building and Mechanical Engineering Drawing exam for the Caribbean Advanced Proficiency Examination’ (CAPE), 2017. For Abraham, who is in his final year at Signal Hill, and will write level 2 of the subject at the 2018 CAPE exam, the result was not a surprise. His plan was to get a Grade 1 in the subject at Lower Six so that for his Upper Six exam, for which he also expects good results, he would be able to get a full scholarship. “I really wanted to achieve more. I am working hard, I did well yes, but I know that I could have done better. I achieved a Grade II but I think if I had put more emphasis into my work I would have scored a Grade I. “I really didn’t think that I did my best. My plan was to aim to get a Grade I in order to achieve a scholarship to broaden my horizon along my career path,” he said in an interview in his classroom on Monday. Abraham, who wants to be an Electrical and Computer Engineer, said that he was first introduced to Building and Mechanical Engineering Drawing in Fourth Form. “When I was choosing my subjects at Fourth Form, I was more focused on my Electrical subjects as this is my career path and I was told that I should pursue Technical Drawing to accompany it and well I actually like it… My teacher, who is also my mother, always pushed me to work hard and when she thinks I didn’t do my best, she would put consequences in place to ensure that I did it,” he said. While Abraham said he didn’t feel any particular he got the news of his accomplishment, his mother Stacy Abraham said she was overwhelmed. when I didn’t hear anything, I really didn’t look for it this time around, so it was really, really shocking,” she said. As to her dual role of mother and teacher to Abraham, she said she had no problems with that. “It was no problems, he definitely has the talent. It was never like I had to push him more than any of the other students, he has a natural talent as there was times he used to surprise me. I would give them tricky questions and he would figure it out and I would be surprised so he had a natural talent and I didn’t have to work any harder on him than any of my other students,” she said. Abraham was one of three students from Signal Hill who placed in the top 10 in Building and Mechanical Engineering Drawing in the region. Teacher Abraham describes them as being “competitive amongst themselves.”. “I was really, really surprise because I was pushing the entire class for Grade 1s but I didn’t expect three of them to be in the top ten in the Caribbean. The three of them, they always had that kind of competitive vibes between themselves and the three of them are always at the top of the class,” she said. As for the advice she give to all her students. “Work hard. It really is a lot of work because it is so many different topics, you have so much to cover in the short space of time. For many of the students I know that they were tired but in the end, it really paid off. Prayer was in the centre of it all too because I would always pray for my students,” she said. Reply to "Signal Hill’s Abraham aims for excellence"